Chinese mobile phones that have flooded the Indian market have gone on to occupy almost 15 to 20 percent market share of India’s handset market. Cute looks and advanced multi-media features at cheap rates have made Chinese mobile phones a much sought after product in the mobile phone market in India. But now there can be a major setback to it, with the Indian Government’s proposed ban of Chinese phones due to lack of IMEI code. An IMEI (International Mobile Equipment Identity Code) which is unique with every mobile consists of 15 digits. When the SIM card in a mobile phone gets activated, the IMEI number gets automatically registered with the GSM service provider and it becomes possible to find out the caller’s identity and the location from where the call was made, which will be helpful to the Security agencies. Most of the China made mobile phones available in the market these days do not have a genuine International Mobile Equipment Identity (IMEI) number. Hence the chances of these phones being misused for anti-social activities are very high. Since mobile phones without IMEI number are big security hole and also recently, the mobile phones used by terrorist had no IMEI numbers. Telecom department is working upon the issue and we may soon see the ban on calls made by Chinese phones. Telecom Dept has also asked mobile vendors to stop selling Chinese Phones. However, according to a recent Economic Times report, the Government is planning to extend the deadline until March 31, 2009, as the industry has developed a software that can assign an IMEI number to these phones with the help of a software update. In October, the DoT (Department of Telecommunications) had asked companies to store IMEI numbers in their Equipment Identity Register (EIR) databases. EIR is used to ensure that calls made from a stolen handset having a unique IMEI can be traced and blocked – rendering it useless. The same technology can be used to identify cell phones that lack an IMEI or just have a couple of zeroes for the IMEI number to effectively bar calls from such handsets. The COAI (Cellular Operators Association of India) is planning to approach the government to seek an extension until the the IMEI assigning software can be added into phones via the update. The issues under consideration are the large user base for these phones and the fact that the handsets would be rendered useless after implementation of the directive, resulting in a loss to its innocent owners. The COAI is planning a drive to make people aware about the dangers of using a non-IMEI handset and about the software update that is expected to cost Rs. 100 per phone, which is a nominal amount considering it can save a phone from becoming useless. Ed note- Source- Techtree & Economic Times. Yahoo has stopped developing Yahoo Messenger for Vista and it is no longer available on Yahoo’s servers. Well, this is pretty old news as Yahoo announced this on October 24th, 2008. I’m writing this post to express my anguish on this decision. I am disappointed and shocked at this move by Yahoo. According to Yahoo, they want to concentrate on one single version for Windows. Can they explain what they mean by “concentrating on one single version”? Is Yahoo’s developer team so incompetent that they don’t know WPF applications can also run on Windows XP SP2+ with .Net 3 framework installed or they simply don’t know how to make WPF applications? Yahoo Messenger 9 is the only version you can download for Windows now. Oh wait a minute! Is it even worth downloading? Yahoo Messenger 9 is one of the ugliest applications developed for Windows. I was desperately waiting for the Vista version in order to get rid of Yahoo Messenger 9 and then suddenly Yahoo announces the untimely death of the Vista version. It’s a sad reflection on Yahoo! that they felt they had to do this. YM4V was certainly innovative and could have easily been tweaked to work with Windows 7 when it’s finally released. The approach taken by Yahoo!, is understandable if you believe the line that they want one app which will work across all MS platforms. I don’t. Although they were onto a winner, I believe this decision came about because their finances are hurting right now due to their lower than expected revenue earnings. Reports also abound of a round of staff cuts – on top of the one earlier this year. C’mon Yahoo! – be honest. Your failure to merge with MS (due to your unreasonable expectations) has hurt you and is likely to continue doing so. Time for some serious changes at board level! Stop working on other MS OS’s and concentrate on Vista, using it as a springboard for W7. YM4V was way ahead of anything else available and it reflects badly on the company to finally admit they’ve pulled the plug (development stopped a long time ago didn’t it?) and will also do absolutely nothing for investor confidence. How many more bad moves are you to going make? Should I discontinue the use of Yahoo Messenger and add my Yahoo contacts on Windows Live Messenger? I’ll seriously consider this way of protesting against this decision of Yahoo. What do you think? 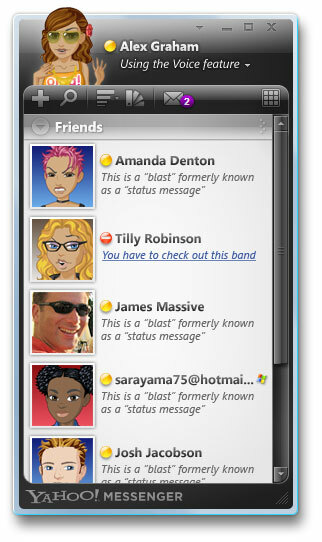 Don’t say- Goodbye, Yahoo Messenger for Vista. Do say- Goodbye, Yahoo Messenger. It is common knowledge that Apple pays close attention to design of their hardware as well as software. Mac OS X Leopard is by far a better designed OS than Vista ever will be. Apple’s iLife suite has no competition and the Mac desktops and laptops are the best designed in the world. And don’t mistake design to be ‘eye candy’. That’s a well written article by Milind. It’s kind of true that most of the Windows applications are cluttered and developers need to wake up. Windows Vista will have some better applications, hopefully, in near future. MS Office 2007 & Yahoo Messenger for Vista are some of the examples. Developers need to follow WPF. Applications made on WPF look pretty good. Slowly but surely Windows will have applications which we’ll love to work on. Step 1: Count the number of gadgets you have on which you can listen to music. Step 2: How many times did you enjoy listening to the music by heart? If the number in the answer to the question posed in Step 1 exceeds that in Step 2, watch out, you are addicted to technology than you ought to be. Remember, we don’t need any electronic gadgets to enjoy the chirping of birds, the rustling of leaves, the rhythmic sound of the flowing river…the list can go on and on and on. Do give it a thought!